Nicolas Maduro (C) speaks to a crowd of supporters flanked by his wife Cilia Flores (2-L), Venezuelan Vice-president Delcy Rodriguez (R) and the head of Venezuela’s Constituent Assembly Diosdado Cabello, among other supporters. In a national address, López said he had been in communication with his field commanders and different branches of the military and they were unified in their support of 56-year-old Maduro. Venezuelans have been waiting for signs of fraying in the military after Guaidó, the head of the National Assembly, swore himself in as interim president on Wednesday and called for new elections. The United States, Canada, Brazil and Colombia, among others, have recognized Guaidó as the head of state, but analysts warn that he’ll need military support in order to effectively carry out a transition. He also said the armed forces support members of the European Union who have been advocating for a negotiated solution to the crisis. 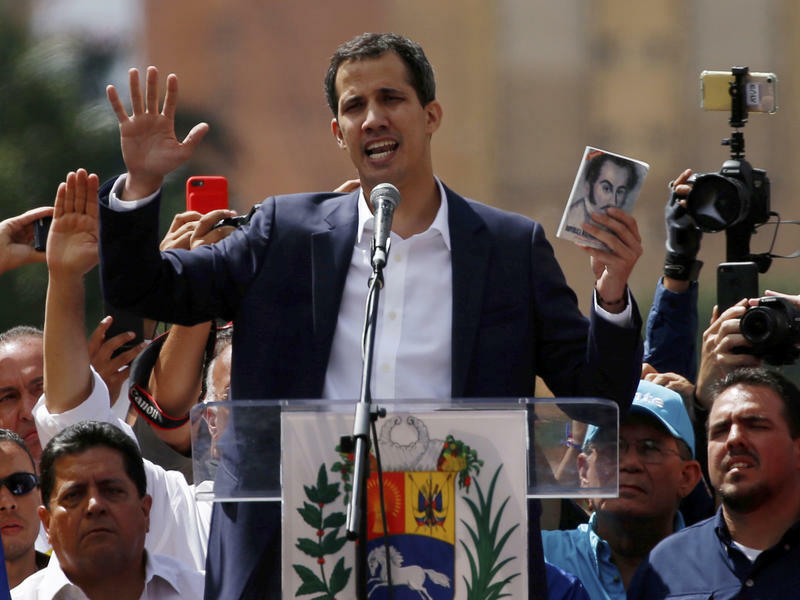 Raising his right hand before a cheering crowd of supporters, Juan Guaidó declared himself interim president of the country, called for new elections and put himself on a collision course with Nicolás Maduro, Venezuela’s embattled but still powerful leader. Venezuelan opposition leader Juan Guaidó declared himself the country's interim president amid nationwide protests Wednesday, in a bid to seize power from sitting leader Nicolás Maduro. The U.S. swiftly proclaimed its support for Guaidó. Maduro responded by announcing a break in diplomatic relations with Washington.